Of the many daily activities that are affected by foot surgery, the ability to shower is often overlooked and not considered until after the surgery is over. Bathing is still an important part of life, and special consideration and preparation needs to be made to continue to do this activity uninterrupted after surgery. It is of utmost importance that your surgical dressings stay dry, as water exposure to the surgical incision through the dressings can lead to a serious infection, delay the recovery, and potentially undermine the success of the surgery by creating a new complication. Shower water in particular contains large amounts of bacteria that wash off the skin and backside, leading down to the foot in the end. Avoidance of this water (and any moisture in general) can help keep the surgical site healthy and help prevent infection. You essentially have three options for bathing following foot surgery. The first option is to take a sponge bath. This consists of using a sponge or wash cloth and soapy water to scrub yourself, and rinse with clean water using another sponge or wash cloth. This technique is time consuming, and results in a lesser quality bathing experience. It also may requires the assistance of another person. The next option is to carefully take a bath while holding the dressed foot outside of the tub. This requires a certain level of dexterity, as well as great care not to splash water onto the dressing. One must be very careful getting into and getting out of the tub, as well as during drying. It is too easy to step into a small puddle or wet floor mat created during the drying process and expose the gauze dressing to moisture, so greater care must be taken even after the bath is over. The final option, and the easiest, is to use a commercial grade shower protector. These device is designed to keep limbs dry so that one may shower without exposing the foot to water. 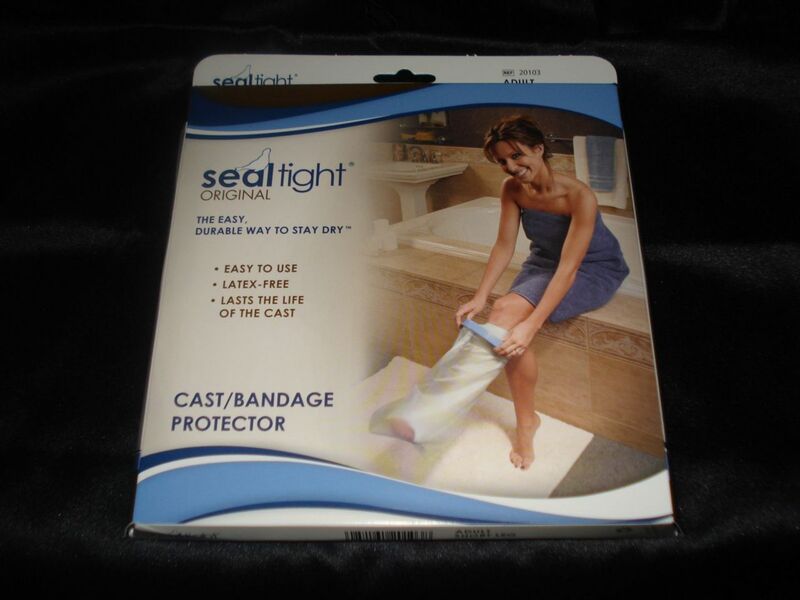 It works well for this purpose (but does not work in a bath as it cannot protect the foot when submerged underwater). The traditional technique of using plastic bags and duct tape to protect the foot often fails, and is not suitable for something as important as a surgical dressing. We carry a very reliable brand in our office for a reasonable price. A shower protector allows for unrestricted showering, and is reusable many times over. The only limitation for this option lies in whether your surgeon allows for partial weightbearing in the shower or not, based on the recovery need of the specific surgery performed.